Marlaine joined us in 2014. She is a creative tour de force and has established her own customer base. Marlaine’s flexible approach to customers has enabled her to create beautiful designs with individual touches, which reflect our customers requirements. With substantial fabric, wallpaper and product knowledge, she loves to inspire customers and create bespoke schemes. Elaine has years of experience making beautiful, hand made soft furnishings to the highest standard. She has a creative mind and a great understanding of fabrics, window dressings and all types of soft furnishings. Elaine’s eye and ideas for exquisite detail means that our customers can enjoy furnishings, which are individual and will last for years to come. Amanda will often be your first contact with us. She will ensure that your order works smoothly through our system and that your fitting is arranged. 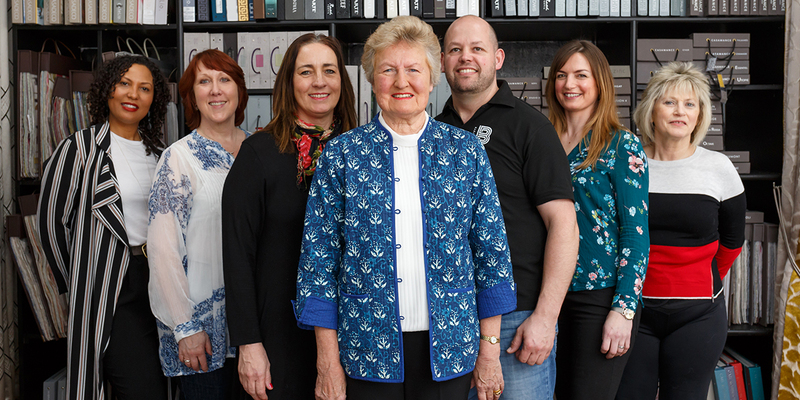 As well as administering our office and showroom, she also has a passion and eye for interior design – with the product knowledge required to help customers in the showroom. Carole is now semi-retired, but still enjoys making furnishings and keeping her hand in with the activities of the business. Martin joined the company in 2016 as our full-time fitter. He takes care of everything behind the scenes, ensuring that all orders are ready to fit. Anne has decades of technical and design experience. She is one of our full-time surveyors and measurers. Anne has extensive experience in measuring unusually shaped, double height and apex windows, as well as design and styling knowledge. Sue takes care of the day to day running of the accounts making sure that all is in order and that all accounts payable are paid on time. She still manages to do all this with a smile. Also making up our team is an excellent, long standing, self-employed work force including curtain makers, upholsterers, decorators, and curtain and blind fitters. With so much knowledge and experience, Bryant Interior Furnishings can fulfil any interior furnishing projects. We are always on the look out for great people with skills and experience in the trades mentioned above. If you have skills, knowledge and experience within our industry then we would love to hear from you. Please contact us to if you are interested in further work opportunity.